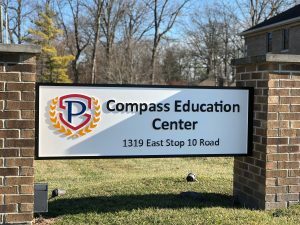 Perry Township Schools is excited to announce the opening of our newest education option – Compass Education Center. The full-day program, located at 1319 E Stop 10 Road, opened Jan. 7 to serve Perry Meridian High and Southport High students who need extra help to advance toward graduation. The Compass Center is unique because it was created to help students who have fallen behind in earning credits and may be more successful in a smaller school environment. The program will accommodate approximately 75 students with a target of fifteen students in each class. Unlike an alternative-to-expulsion program for students who have received disciplinary action, the Compass Center will offer a small group environment to encourage focus on course completion, and opportunity to earn credits over a shorter period of time. Prime candidates are seniors with 25 or less credits, juniors with 15 or less credits, and sophomores with 10 or less credits. Like Perry Meridian and Southport High schools, Compass has licensed educators who teach math, English, social studies, and science. Some courses such as science, social studies, and other electives will utilize some online curriculum. Students also have the option to take courses at Central Nine Career Center which provides career-based instruction in several in-demand industries including aviation, computer technology, and construction. Students at Compass who complete their graduation requirements will graduate among their peers at their home high schools on May 24. The Compass Center does not replace our James Whitcomb Riley Alternative Program. Rather, it provides a different environment where students can flourish academically. For more information about Compass, call 317.789.3965.